The most complex part of your garage door system is arguably the opener. This motorized unit is the driving force behind your door, and is designed to provide many cycles of smooth, hassle-free operation. However, as with any complicated system, this device can gradually develop some problems over time. Why Do Openers Develop Issues? Garage door openers can often be used more than a thousand times per year in a busy household, so it’s no surprise that they’re subjected to a lot of wear and tear over the years. As with any complex machine that are comprised of many moving parts, things can slowly wear out. Dust and dirt can creep inside the circuit board, motor gears can wear out and eventually break, and pulley systems can become misaligned or detach. Garage door openers are specially-designed to work smoothly and reliably, especially if they are made by some of the name brand manufacturers such as Genie, Liftmaster or Marantec, for example. If your opener begins to work erratically, slowly, jerkily or noisily, it may be a sign that something is beginning to break. It’s likely that the problem will worsen over time until the opener will eventually fail, so we strongly advise contacting our professional technicians as soon as you notice a problem with your opener. 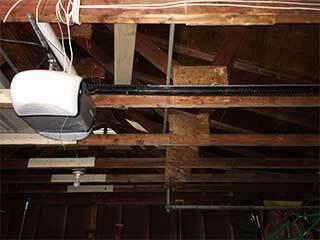 Another thing our company can do for you is help you choose and then install a new garage door opener. Finding the perfect unit for your home can become a hassle really quickly, from choosing between the different types of drive-systems to considering the various safety and security features available. Our experts can consult and guide you through the process to help you make an informed decision. Our trained technicians are able to quickly and professionally repair or install openers of every type and model. Call our team at Garage Door Repair Elmhurst if you need any type of professional assistance.